I'm not a designer, but I love fonts! I use them on a regular basis for this blog, and to create the thumbnails of my YouTube videos. I enjoy browsing through fonts, and finding what I think is the perfect fit for my projects. I like fonts so much, but even more because they're free! You can even find most of these free fonts if you're using PicMonkey to create your images, but you won't have access to all of them unless you have the paid subscription. You can always find them for free if you download it from other font sites. I like downloading most of them from DaFont.com, but there are other great sites like 1001 FreeFonts, Font Squirrel, and Font Space. Don't forget Creative Market offers free goodies every week, including free fonts! Here are my top twenty free fonts that I use for my blog images. After all, nice fonts and pictures add emphasis to your blog posts! *Click on any of the font name link to download. You can already tell I used the free fonts I mentioned to create the images for this blog post haha. Can you guess what fonts I used to create the main images? Thanks for passing, and I would love to know what are your favorite fonts! Ok I thought I was the only person obsessed with fonts! Great post and now I'm off to look for a font plug in. The graphic designer inside me is jumping up and down right now! Love all of these! When I make my graphics for my blog I like to use a combination of handwritten and modern texts. Always looks so good. I LOVE new fonts...I too have an obsession. The cursive ones are my favorites. Thank you for posting this. I love some of these and would love to use them in my blog. I absolutely love fonts and have spent way too much buying them so thank you for posting about getting these lovelies for free!! I am sure I will have a few within the next few minutes. Thank you so much for posting this. I'm always looking for new fonts. I love the Sophia font! 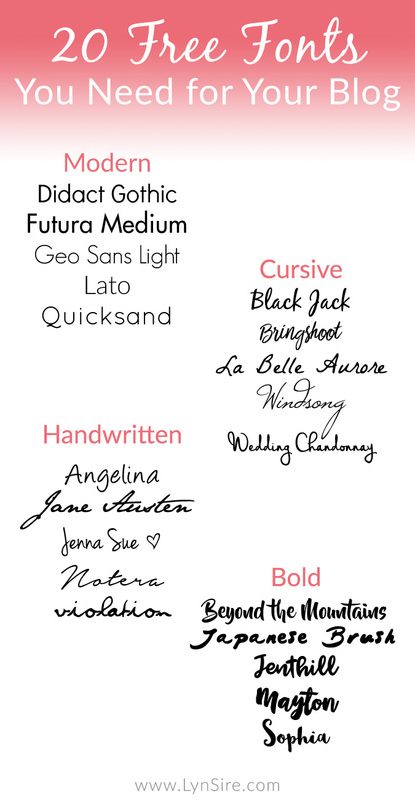 I have a big font collection and you have some of my favorites listed. I also see a few new to me I need to download. Love this! My favorite font is Great Vibes.